finally, the awning is up and i can stop using those awful blinds! dear bobbie came over to lend me a hand with the ‘fabric’ part – i had already wrestled the frame up before she happened to call. well, actually, i was on the ladder doing same when she called. 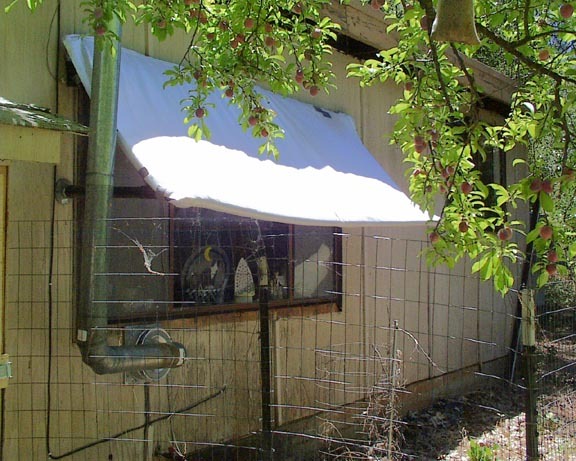 everyone laughs at my awning – it is something i built myself – no, not from wood or metal. it is the black plastic ‘abf’ (i think that’s it – it’s not the white plast pvc, this is the one usually used for ‘outgoing’ water/waste). had to use this and not pvc because pvc doesn’t come in the “Y” shape i needed. guess i should have taken a picture of just the frame, before we put that ‘fabric’ on. it’s not normal fabric, it is the insulating stuff that is silver on one side and something like quilt batting or fleece on the other. the silver makes a great heat reflecter!! the window is about 10 ft long, i think. one of those very old ones with the large pane in the middle and the sliders on either side. old, single pane, metal frame, etc. makes for a great view, but murderous sun/heat in the summer afternoons!! as i was reinstalling/repairing (lots of duct tape) the frame it occurred to me that a real awning would be ever so lovely. something that would roll up into a tube and thus be somewhat protected under the roof overhang, when not in use. what came to mind was the awning that i have on the rv. sooooo, i am going to check out my camping world magazine the next time it shows up and see what kind of price range we are talking about. probably more than the whole cottage is worth!! ok, my frozen pizza is done, so i will go take a quick picture and get this posted. now isn’t that just grand! ^_^ hey, it feels cooler in here already!! 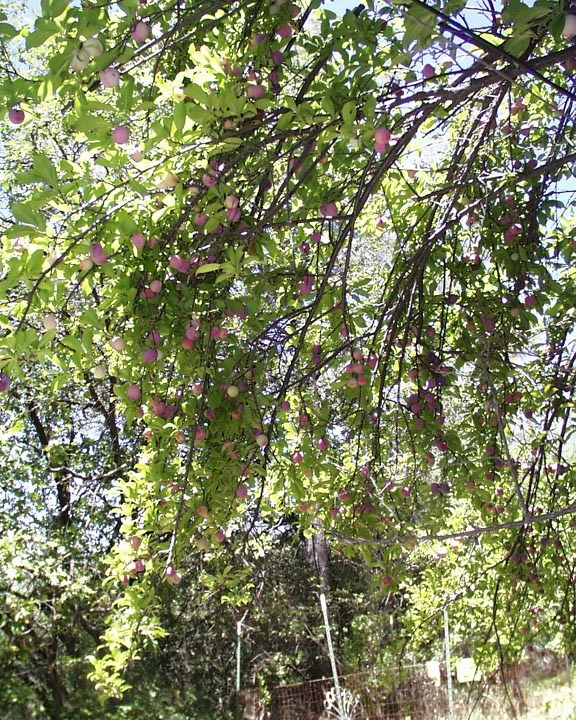 and look at all those plums – and here’s how the other tree looks – loaded!! they need at least another 4 weeks, then will be very sweet and juicy!! Nice awning. I’ve been trying to figure out how to make one, and attach it to the window frame. i just sent you an email about it. if you don’t want to attach the sticky stuff to your window frame, just tack some thin strips of wood to the frame first.